We have FINALLY reached my favourite time of year…. rhubarb season! Which means I can make my favourite dessert ever – the humble rhubarb crumble. This year, I have created a new healthier crumble recipe to share with you all and I have to say it is the BEST thing I have ever eaten. No joke. I know rhubarb can be a love or hate vegetable (yes, it is a vegetable! ), but personally I adore it – it is tremulously good for you! 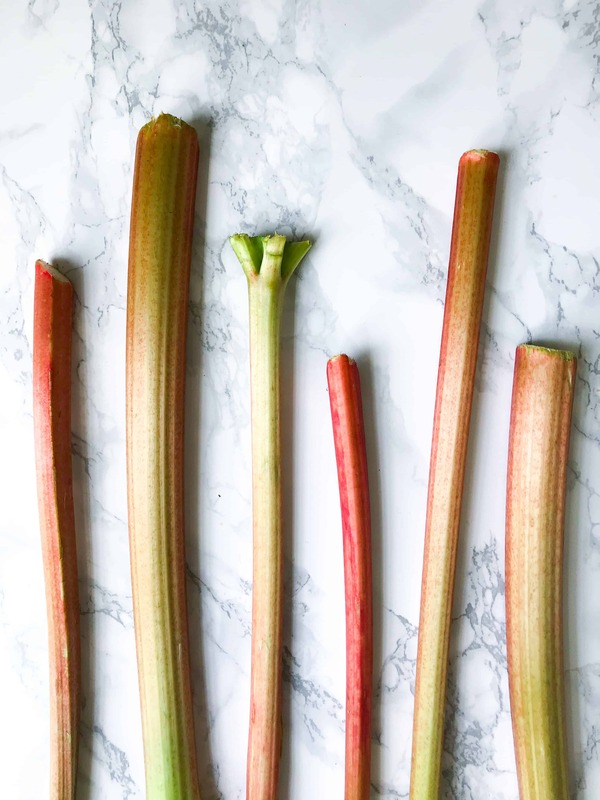 Rhubarb is packed full of fibre, protein, vitamin C, vitamin K, vitamin B complex, calcium, potassium, manganese, magnesium, as well as being rich in compounds such as beta-carotene, lutein, and zeaxanthin. So, if you are reading this as a rhubarb hater you just MUST try my oaty rhubarb crumble – it is sure to convert even the toughest of critics. Although the traditional crumble contains fruit, it isn’t generally known as the healthiest of puddings. But here on ‘Georgie Eats’ I wanted to change that, no, I NEEDED to change that. 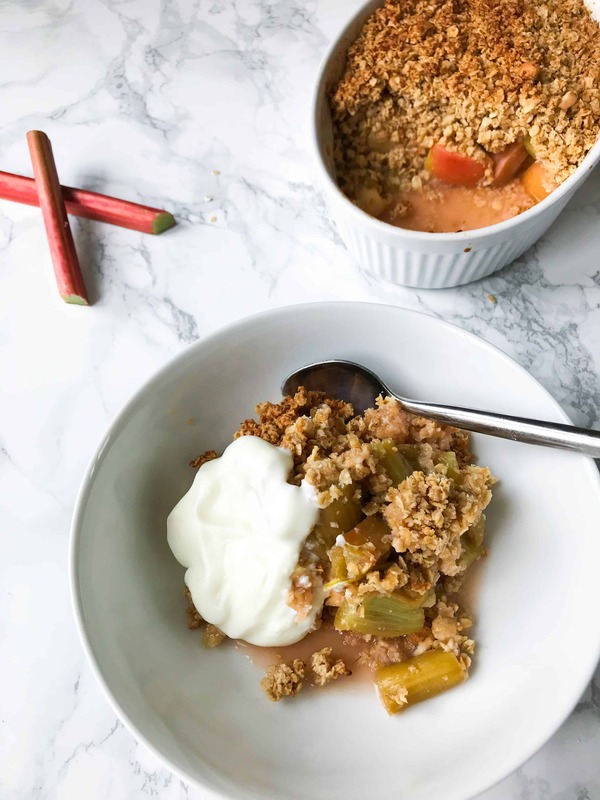 This oaty rhubarb crumble recipe contains no refined sugar, is vegan, gluten free and COMPLETELY guilt free – not to mention unbelievably tasty. 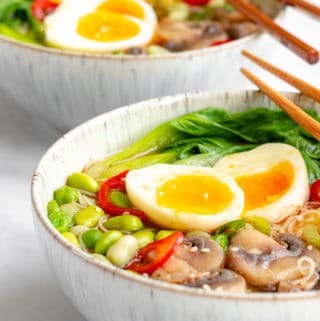 You can eat this every day if you wanted too… I have. 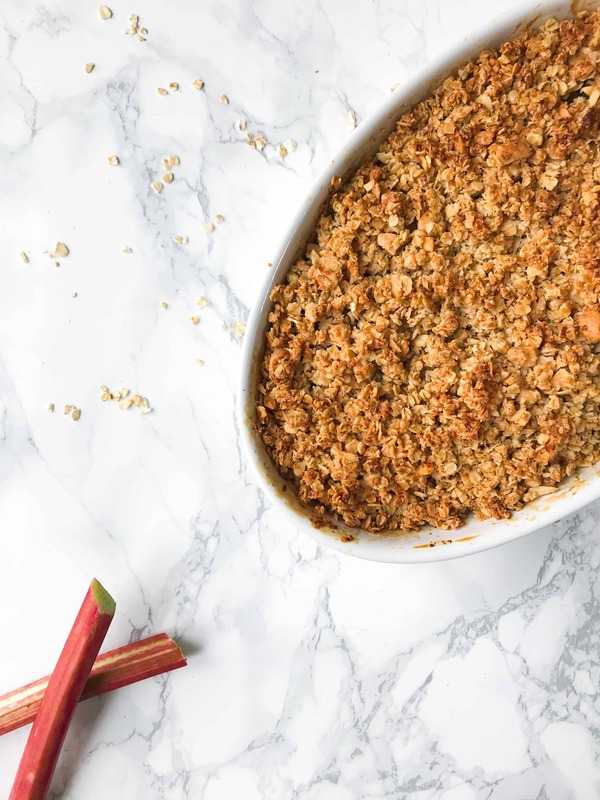 My rhubarb crumble recipe is super simple and consists of hardly any prep. It is the perfect dessert to feed a crowd, or just as a treat for yourself… I have to admit that whilst recipe testing for this crumble I ate a full dish in one sitting. I feel no shame – it was just too tasty. 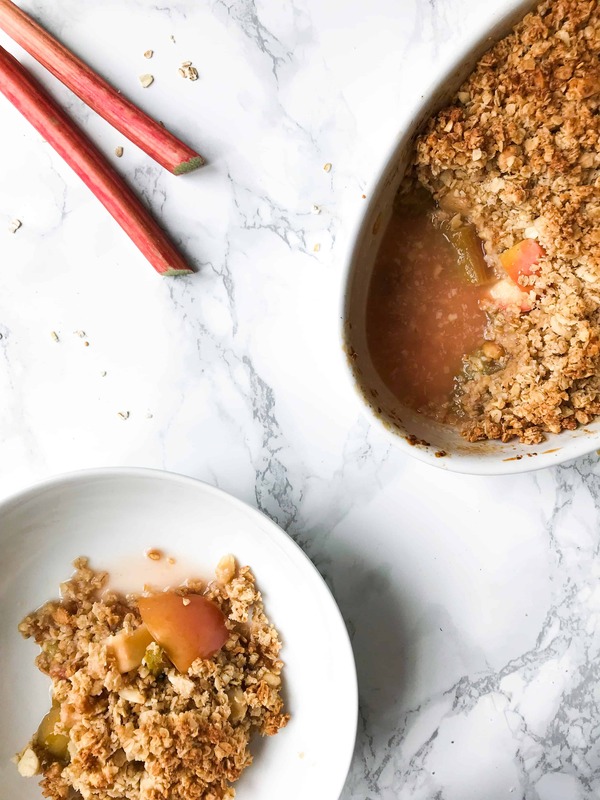 The crunchy oaty crumble topping mingles with the sweet but slightly sharp juices of the roasted rhubarb to create what I can only call a mouthful of utter bliss. The BEST rhubarb crumble recipe ever - you won't believe it is good for you! Sweet but sharp roasted rhubarb with a nutty, oaty and crispy topping. It's utter bliss... 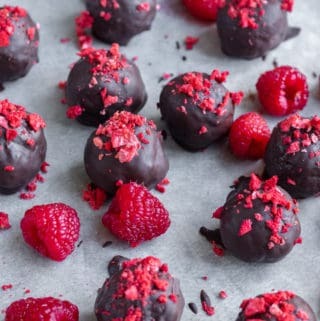 This recipe contains no refined sugar, is vegan and gluten free. Preheat the oven to 180ºc fan/200ºc/390ºf. Place the chopped rhubarb into a medium oven proof dish and drizzle with the 2 tbsp of honey / maple syrup. Place the dish into the oven and cook for 10 minutes before removing and mixing to assure all the rhubarb is mixed with the sweetener. While the rhubarb is cooking, place 45g (1/2 cup) of the rolled oats into a food processor and blitz into a flour. Add the oat flour, oats and all the remaining crumble topping ingredients into a large bowl and thoroughly mix with a wooden spoon until the mixture begins to clump to resemble large breadcrumbs. Place the crumble mixture onto the top of the rhubarb and return to the oven to bake for 30 minutes until golden brown and crispy. Allow to cool for 10 minutes before serving. I love serving this oaty rhubarb crumble hot from the oven with a dollop of cold yogurt or icecream. If you do not like the taste of coconut, do not worry! The desiccated coconut in this recipe is used to create texture and you cannot taste it. Do make sure that coconut you use is unsweetened though! If you do not have a food processor you can use shop brought oat flour or regular wheat flour (not gluten free). 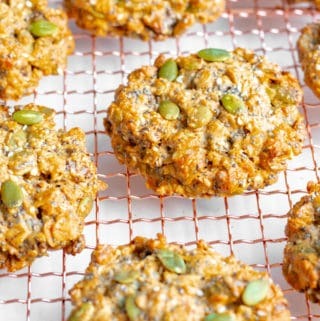 In this case use 30g of flour and 140g of rolled oats to make the crumble. 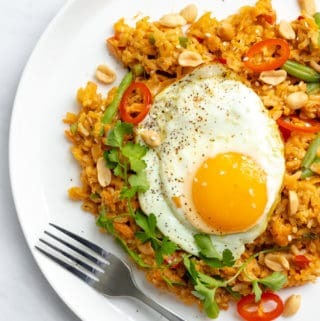 I like flaked / chopped almonds in this recipe, but you can use any nuts you prefer. This crumble topping works great with any fruit. Just adjust the cooking times accordingly. 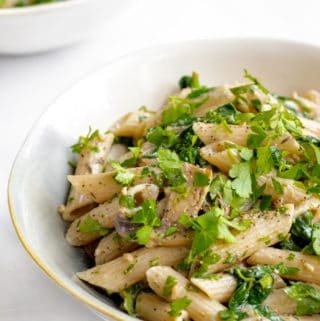 Any left overs can be stored in the fridge for up to 3 days and reheated in the oven or microwave. This oaty rhubarb crumble is also brilliant served cold for a indulgent breakfast! Rhubarb anything is always a winner in my book, and this crisp looks FABULOUS! i have shocking and upsetting news: i’ve never baked with rhubarb! that said, this looks DELICIOUS and is more than enough reason for me to start!